Like its famous hutspot , the modern cuisine of the Netherlands is a hodgepodge of indigenous and foreign influences, some a recent reflection on the nation's diversity and others going back millennia. Little is known about the pre-Christian inhabitants of the Netherlands, but their influence on Dutch food may endure to this day in the form of festive breads like duivekater; braided breads and cookies such as krakelingen; and typical Dutch Easter treats, decorations and celebrations, the origins of which may be traced back to the symbolic sacrificial offerings and rites of the region's ancient religions. The influence of Roman culinary practices was felt long after the decline of the Roman Empire: a taste for savory and spicy flavors expressed in Roman cooking through the use of spices such as black and white pepper, herbs and liquid salt liquamen or garum (similar to Vietnamese nuoc mam). The early trade in Asian spices enriched the medieval Dutch palate. Merchandise was transported by land through Asia to the Levantine harbors of the Mediterranean whence Venetian ships took it to Italy. From there it was traded to the north along rivers and land routes, and exchanged at the fairs of France for the Northern European products, such as woolen cloth and timber. The spices that were traded included both those known and enjoyed in antiquity, such as pepper, ginger, cardamom and saffron, as well as more recent favorites, such as cinnamon, nutmeg, mace, cloves and galangal. These new exotic spices became fashionable in court and cloister, possibly because of their high cost, which added to a host's status and prestige. The same may be said of another product from the East that found its way into Western Europe through the Crusades: cane sugar. Sugar was much more expensive than honey (then the universal sweetener) and, like many spices, only available to the elite. Studying medieval recipes, it's clear that some dishes and ingredients we'd now label as Mediterranean or Asian were already known by cooks working in Dutch castle kitchens in the 15th and 16th centuries, long before many dishes and ingredients now considered "typically Dutch." The earliest known culinary writings by cooks working in the kitchens of Europe's royal households were much copied in the 14th and 15th centuries, so that Italian and French recipes entered the Dutch kitchen early on. The first printed cookbook in the Netherlands was published by Thomas van der Noot in Brussels under the title Een notabel boecxken van cokeryen ("A notable book of cookery") in about 1514. These recipes show that Dutch bourgeois cuisine was deeply influenced by French, English and German cooking, which also mutually influenced each other. Most legumes we love today were only adopted in the 16th century. Before then, only lentils, chickpeas and broad beans were known in Europe. Potatoes, which are now seen as an integral part of Dutch cooking, was only introduced after the discovery of America, and did not become a food for the masses before the 18th century. By the 17th century, The Netherlands' castles and manor houses were famous for their conservatories, where vitamin-C rich fruits, such as lemons and oranges, as well as other exotic fruits and herbs were grown. These so-called "orangeries" were the forerunner of today's greenhouses. While beer was the beverage of the common man, wine was also a beloved beverage in the 16th century. Much was imported from France and Germany, but there were also local wineries in the Netherlands at this time. Rhine and Mosel wines were popular with the elite, as well as a sweet wine, known as Bastart (similar to Marsala wine). The Dutch East India Company (Verenigde Oost-Indische Compagnie or VOC in Dutch), was founded in 1602 and was instrumental in creating the Netherlands' powerful East Indian empire in the 17th century. With its capital in the port city of Batavia (now Jakarta, in Indonesia) and trading interests in India, Sumatra, Borneo and Java, the VOC is often called the world's first multinational and was the first company to issue stock. The trading corporation's main edible imports included many of today's typically Dutch store cupboard staples, such as pepper, cinnamon, cloves, tea, rice, coffee, nutmeg and mace. While many of these spices were already beloved in the Netherlands, they were extremely expensive and remained so until the Dutch East India company started bringing back shiploads of these aromatics, placing them within closer reach of ordinary Dutch people. The first Dutch coffee houses opened in 1663 in The Hague and Amsterdam. By 1696, the high price of coffee prompted the VOC to grow its own coffee in Java. By the 18th century, tea, coffee and hot chocolate were the fashionable drinks of the day, praised for their so-called "medicinal properties." Only the elite could afford them, however. It took a while before these luxury goods were within reach of everyone. The VOC was dissolved in 1799, but left a lasting legacy in the Dutch kitchen. Many of the Netherlands' famous foods are made with typical VOC spices: traditional dried sausages like metworst, cheeses studded with cloves and cumin and the nation's most beloved cookies, including speculaas, kruidnoten, pepernoten, jan hagel, stroopwafels and taai-taai. With colonies and settlements in Africa, Asia, North America and the Caribbean, the Netherlands were once a mighty colonial power. The Spice Islands were considered the jewel in its colonial crown and the Dutch embraced Indonesian food not only in the colonies, but back home, too. 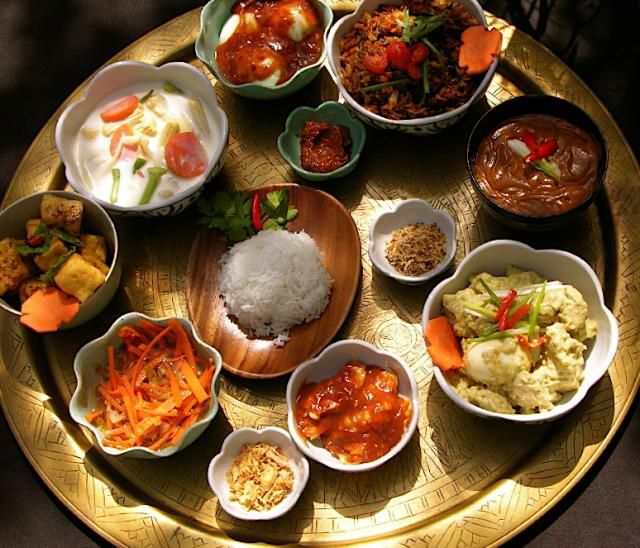 The Indonesian rijsttafel (literally, "rice table") was a Dutch invention, which combined the traditions of various regional kitchens into a celebratory meal that was, perhaps, an early "tasting menu" of small plates, along with rice and spicy sambals. Now, the Dutch consider Indonesian food to be almost indigenous and they are quite likely to take foreign visitors to an Indonesian restaurant when they are entertaining. Meals like bami goreng, babi ketjap and satay are mainstays in many modern Dutch homes, while the bamischijf (a deep fried snack of noodles in a bread crumb crust) and patat sate (Dutch fries with satay sauce) are excellent examples of Indo-Dutch fusion foods. Perhaps surprisingly, the former Dutch colonies of Suriname and the Netherlands Antilles have not had a huge impact on Dutch cooking yet, despite their obvious tropical appeal. Some argue that Surinamese and Antillean immigrants have pretty much kept their cooking to themselves, with the result that it has not become as widely entrenched as Indonesian, Turkish or Moroccan cooking. Nowadays, you can find the odd Surinamese sandwich shop and toko (immigrant store) selling Surinamese and Antillean groceries and snacks, while ginger beer and plantains are starting to edge their way onto supermarket shelves. Guest workers from Turkey and Morocco came to the Netherlands in the latter half of the previous century. As they made a permanent home in the Netherlands, many opened corner shops and restaurants. In fact, the abundance of Turkish and Moroccan restaurants in the Netherlands has been very instrumental in familiarizing the Dutch with Turkish and Moroccan food. And because it is so easy to buy all the ingredients in little immigrant shops around the corner, Hollanders have started trying their hand at some Turkish and Moroccan recipes at home, too. Dishes like couscous, hummus and tajines have gone from being exotic to everyday in a matter of a few decades. Turkish pizzas, kofte, kebabs and pita are popular street foods and Dutch chefs are using Moroccan merguez sausages, dates, harissa paste, Turkish bulghur wheat, pomegranates and bread in exciting new ways. The Netherlands have also left behind their mark in former colonies and territories. The oliebol, which was taken to the New World by early Dutch settlers, possibly evolved into the donut. In South Africa, the oliebol is the precursor of koeksusters and vetkoek. Contrary to the saying, "As American as apple pie," the Dutch have been baking them since before the USA existed, and possibly took their traditional Dutch apple pie recipe with them to the New World. Dutch settlers also popularized the pancake in the USA and South Africa, and gave the latter its beloved milk tart and soetkoekies (similar to speculaas cookies). The Dutch also introduced the cookie to North America, and even the word cookie owes its etymology to the Dutch word koekje. Sources: Spices and Comfits: Collected Papers on Medieval Food by Johanna Maria van Winter (Prospect Books, 2007); Brood- en gebakvormen en hunne beteekenis in de folklore ("Bread- and pastry shapes and their meaning in folklore") by J.H. Nannings (Interbook International, 1974); Kastelenkookboek ("Castle Cookbook") by Robbie dell' Aira (Uitgeverij Kunstmag, 2011); Koks & Keukenmeiden ("Cooks and Kitchen Maids") by J. Van Dam and J. Witteveen (Nijgh & Van Ditmar, 1996); Die Geskiedenis van Boerekos ("The History of the Boer Kitchen") by H.W. Claassens (Protea Boekhuis, 2006).